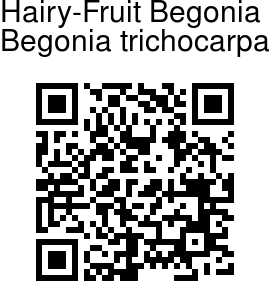 Hairy-Fruit Begonia is large herb with stem reddish, flaccid, nearly erect, hairy. Leaves are up to 8 x 3 cm, ovate-oblong, long-pointed, obliquely heart-shaped at base, hairy, membranous, 5-nerved from the base; stalk 1-3 cm long. Stipule is 6 x 2 mm, lanceshaped. Flower cymes are 2 cm across, lateral, carried on stalks 1-2 cm long. Flowers are borne 1-3 together, male sepals 4, outer sepals 5 x 7 mm, hispid, inner smaller, curved, hairless; female sepals 4 or 5, similar to male flowers, ovary hairy, 3-locular, placenta single, styles 3, each divided in to two branches at tip. Capsule is 1 x 2 cm obovate, flat at tip, wings acute above, seeds minute, many, hexagonal. 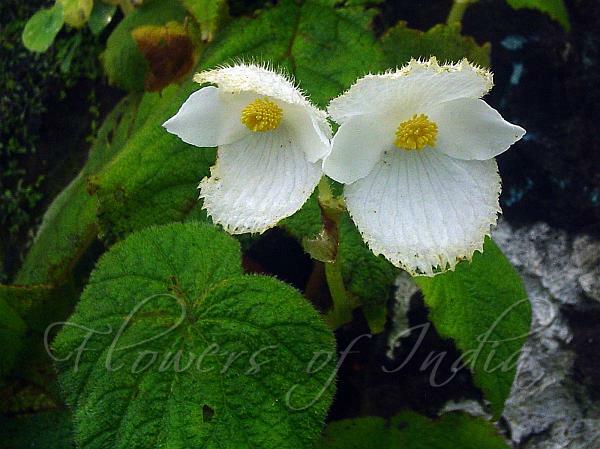 Hairy-Fruit Begonia is endemic to Western Ghats. Flowering: August-December. Photographed en-route to Vishalgad, Maharashtra.